Happy Friday everyone! Hello to all my new readers out there! I couldn't be more pleased that the weekend is here. It's Labor Day Weekend which means saying goodbye to summer and long days at the pool. Fall is my absolute favorite season (maybe I'm bias)! I love cozy sweaters, boots, and camping. This quick little treat is perfect when your relaxing by the fire or cozy under the covers! It takes about five minutes to make, and it's pretty good if you ask me. It is no gourmet chocolate cake, but it will hit your sweet tooth, and fulfill your chocolate craving! Grease your mug (please don't forget, it's terrible to try and get out if you don't)! Add all of your dry ingredients together and give them a good stir. Whisk together your egg and milk in a small bowl, and add it to your dry ingredients. Now it's time for oil and vanilla, put those in there! Mix it all together, make sure you get down in there so all of the dry stuff is moist. You don't want a big old pocket of flour in there! Just showing off my mug because it's my favorite! I love jelly fish! Microwave your mug cake for two and a half to three minutes and you're cake is ready to go. Be careful, it might be pretty hot! Top with a little dusting of powdered sugar and some chocolate chips and enjoy! and a Pinterest variation here! 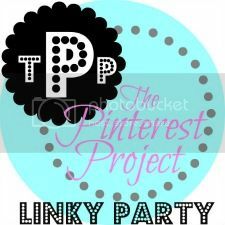 Click the button above to link up your pinterest project! mmmm yummy. i want this now. it is super simple, my husband loves them! Thanks for your lovely comment on my blog yesterday! I bet they are, nothing is better than quick chocolate cake when your studying! Thank you for linking up to TPP - hope to see you again this week! Crazy Awesome! You are welcome to link up this or any other photo/post to Ladies Holiday Photo Friday Blog Hop! Cheers! I've been wanting to make cake in a mug for the longest time and then totally forgot about it! Thanks for sharing, it looks delicious!